So I think I'm going to try to participate in one hop a month that is sponsored by Kathy at I Am a Reader, Not a Writer. And the co-sponsor of this hop is Jinky is Reading. 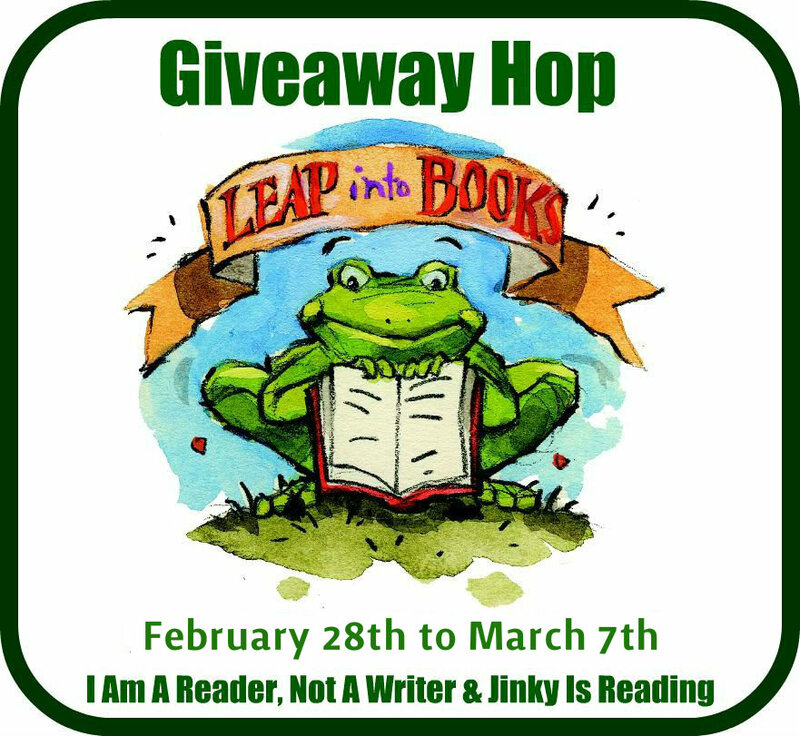 And this month I've chosen the Leap Into Books giveaway, because as a teacher, I like the idea of using this as a theme for some kind of contest or unit in my classroom. And, what I'm choosing to give this time is your choice of a book, any book you want, from The Book Depository, as long as they ship to you (Check here), up to $20. So fill in the rafflecopter below, then make sure you leap along the Linky list of other blogs participating in this hop below the rafflecopter. So tell me, what book are you anxiously waiting on this week? This is hosted by The Broke and the Bookish. 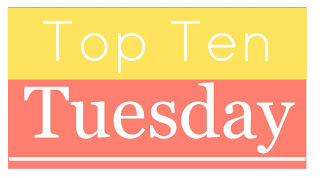 This week's top ten them is "auto-buy" authors. Which means authors that you always buy their books when they come out because you know that you'll enjoy it no matter what, if it's in a series you've read, or not. My first few were at one point, and still kind of are, but I'll give you the reasons why not completely anymore. Stephen King - Up until very recently, I automatically bought all of his books, and in hardcover. At first I even bought The Dark Tower series. And until the new ones started coming out, I had read all of them. But since it has been so long since I read those, and they weren't my favorite to start with, I haven't read on, although I think I've bought at least one more of them. I also didn't buy the one that was about the JFK shooting. Not sure it really is my kind of story. I also did buy The Colorado Kid, but have yet to read it. 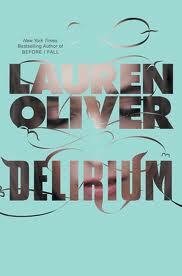 Although loving the Haven series on the SyFy channel, I do think I need to read it! 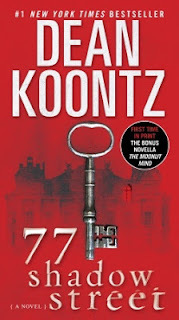 Dean Koontz - Other than his Frankenstein series, I do buy and read all of his books. For awhile it was all in hardcover, until I began having financial issues, and so now I'm back to waiting for the paperback, unless my mom buys the hardcover at Costco. Although, some of his books do seem to be getting a bit formulaic, and while I like that formula, I miss some of his really original ones like Twilight Eyes, Watchers, and Strangers. Robert McCammon - Other than the Speaks the Nightbird series, which I have yet to read, I used to buy all of his books as they came out. Has he had any other new ones? 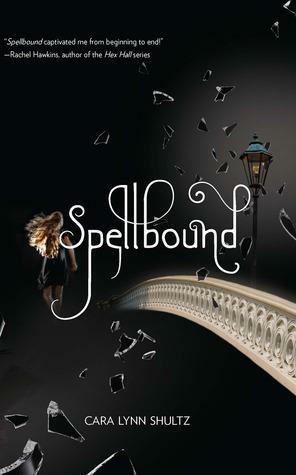 Cara Lynn Shultz - She only has 2 out so far, Spellbound and Spellcaster, but I know she's working on a 3rd, and I'm sure I'll love it too! I just love the way she writes her characters. The sense of humor is so what I have with my friends and family, that reading it is like hanging out with people I know. William Sleator - I don't believe he will have any new ones coming out, but I do love all his books! The out there stories, just really are kind of wicked for kids, and fun to read! Examples of his books are: Test, Rewind, and Hell Phone. Diane Mott Davidson - I'm actually not a huge mystery fan, but I started the first one in this series and have loved them all. She writes the Goldy Bear Culinary mysteries. I love the recipes in them, but they are way too fancy for me to ever try on my own. But I also like Goldy's character, and her husband, and all the other people who are in the books. And while there is a formula to the mysteries, it seems like she comes up with more unique murders and for all of these in this small Colorado town? I think it might not be a good place to live. Maggie Stiefvater - Although I have not read her Faerie series, I have read almost all of her other books. And even when they didn't necessarily grab me from the blurb on the back, or the idea behind the story, once I picked them up, I remembered why I was such a huge fan. She is an awesome author. It took me a long time to read The Scorpio Races, now I love it! Stephenie Meyer - Yes, as I have read all of her books, Twilight series and The Host, I guess probably any book she put out I would have to buy and read. Margaret Peterson Haddix - I love her Among the Hidden series, as well as the new The Missing series. Pretty much with any of her books I know I'm going to like them. Robin Cook - Now, I actually haven't read many of his in awhile, but I have a ton of them sitting on my TBR shelf. For awhile when I started working at a bookstore, I would order in one or two at a time that I hadn't read, or find them at garage sales, or used book stores. More medical formula type stories, but usually always really good. Examples are Coma, Contagion, and Invasion. Now, there are others that I have tons of books, plus lots of TBRs - John Saul, Michael Palmer, or ones that I stopped reading because the author died - V.C. Andrews, Michael Crichton. And there are other people that I love one series, but not all - Charlaine Harris: Sookie Stackhouse, Nancy Holder: Buffy the Vampire Slayer and now Teen Wolf. But the list could go on forever. This top 10 was harder than I thought! What about you, can you come up with a top 10 Auto-Buy author list? Okay, once again I have been totally wowed and am asking myself why in the world I waited so long to read a book by this author. 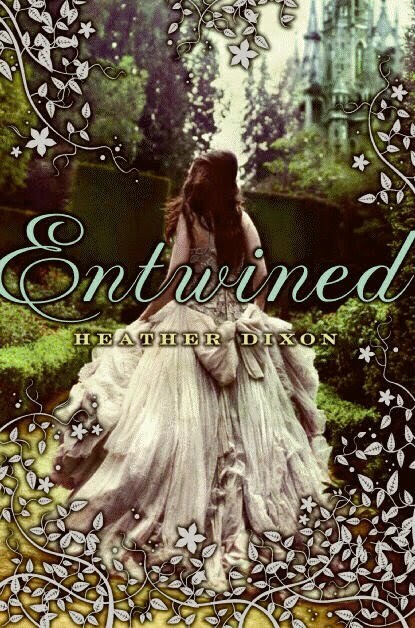 Now, I must admit the other series by this author, is about Fey, and I'm not really into the fairies that much. Not that I haven't read any good books about them or with them, I just haven't quite gotten to the stage where I'll go pick them up. As I've mentioned before, I got this book at BEA last summer and actually got to meet Julie Kagawa, but didn't get her autograph. Hmm. Not sure why. Maybe I'll get another chance. In fact, wonder if she'll be at the Romantic Times Convention in Kansas City in May since her books are by Harlequin Teen. Cool, I'd better go check my list of what authors are going to be there! 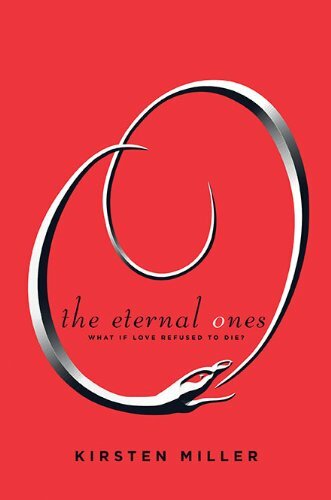 This book, let's just say it sucked me in right away and I was hooked! And it was awesome to start reading it during the big snow storm so that I had all the snow days off of school to really get it read. Now, I've also mentioned that I don't always jump at any and all vampire stories. And often the idea of a world where vampires rule, etc., just doesn't draw me in. But this was done in a way that we weren't in with the vampire society all the time, we were following the main character, Allie Sekemoto, who lived in the Fringes around the vampire city. With people who chose not to be registered, so they weren't required to give blood weekly, or monthly, or whatever the requirement was. She wasn't a "pet" of the vampires, so it was like a post-apocalyptic world, the kind of story I do enjoy. Allie and the "gang" she lived with had to fight for their territory sometimes, and also had to try to find their own food. One day Allie went outside even the fences that surround where she lives with her gang, into the area that is full of rabids. Rabids are vampire/zombies that people became from the Red Lung disease that I read about in 'Til the World Ends. Out there she found a whole shed/basement FULL of canned food and all kinds of good stuff. When she takes her friends out there, after her own close call with a bunch of rabids, something goes wrong and they get attacked. As they try to run back to the fenced in area, two are killed, and as Allie tries to get back, she is overtaken by the rabids and passes out while being fed on. She awakes to the sound of a voice, the voice of a vampire. He is offering her a choice. He can end her pain by giving her a quicker death, or he can end her pain by turning her into a vampire, still a death, but she gets to keep her life going. She chooses to become a vampire. Once she changes and wakes up, her vampire maker, Kanin, begins to teach her the rules of being a vampire. And how to fight, etc. She learns that he is hated by the other vampires, for his role in the past which caused the rabids to form in the first place. And because of this he is hunted. 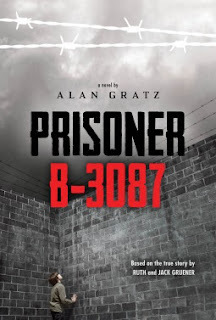 When it seems they have been caught, he sends her away, out of the town, past the fences, because anyone knowing she was related to Kanin would kill her. So as she is travelling, she runs into a group of humans. She is able to fit in because they have learned to travel at night, which works for her because she must sleep all day and stay out of the sun. She has to try to fake eating, etc. But she is happy to be surrounded by humans, and to do what she can to help them. Of course, as you know must happen, she will come to be found out eventually, and she must decide whether to try to help them from the sidelines, or go on her own way. The story reminds me also of road trip types of stories, like The Stand, The Long Walk, Swan Song, and even a bit of shows like The Walking Dead. A group of survivors trying to get somewhere, always distrust between some, dangers, like rabids, or vampires, or people working for the vampires. No food, etc. I love, love, LOVED the book! 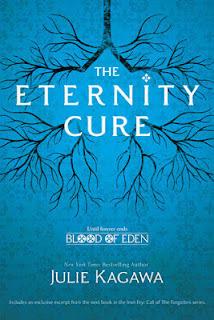 I'll definitely be recommending it to people, and eagerly awaiting the sequel, The Eternity Cure, due out this April! So happy I don't even have to wait that long! Book Spine Poetry - Why am I just now hearing about this? Wow, I can't believe I've never heard of this! This is something I've kind of done in the past. When I was working at the bookstore and would carry piles of books that customers just left sitting out for me to put away. I didn't ever consciously arrange them to make a poem, but I've kind of read the titles together in my mind. I'm not participating in any challenge or contest with this, but I did find it on Oh Chrys! 's blog. So thanks to her for turning me on to this really fun idea! I plan to do more of these in the future as I have time! So, what do you think? Everyone should try it!! Well, this is a hard one. I don't have a lot of people that I share books with. Other than students at school and my friend Kim, and occasionally my sister Sarah. But I'll talk about some students I've given books to I guess. I've really been promoting some books that are going to be on the state award nominee list for next school year, not just because they're going to be on that list, but because I really enjoyed them. Those books I've really been promoting are: The Name of the Star by Maureen Johnson, Legend by Marie Lu, and Variant by Robison Wells. I'm trying to get my sister to read Beautiful Creatures and City of Bones, since they're coming out in movies and I think she'd really like them. So, what books have you shared lately? 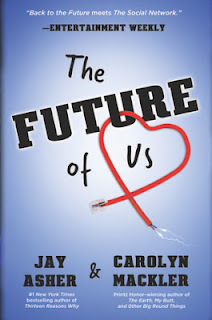 Thanks to Netgalley and Harlequin Teen, I got to read this book as an e-galley. It was the perfect time for a book of short stories, or novellas as they are often called. This was a pretty good book. I have to say that I got The Immortal Rules by Julie Kagawa at BEA last summer (still not sure why I didn't get her to autograph it when I was getting my picture taken with her), and since I haven't read any of her books yet, I've been a bit reluctant, dragging my feet to pick it up. 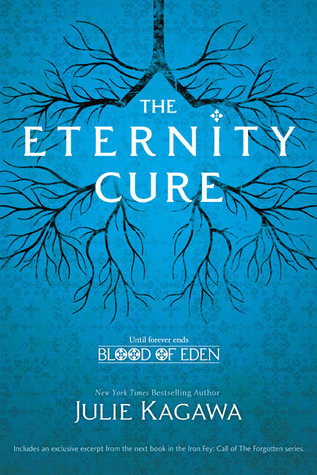 So when I saw this available on Netgalley, and that the first story was a prequel or 0.5 in the Blood of Eden series, I thought what a great way to see if I want to read on, if the story works, if I like her writing, etc. 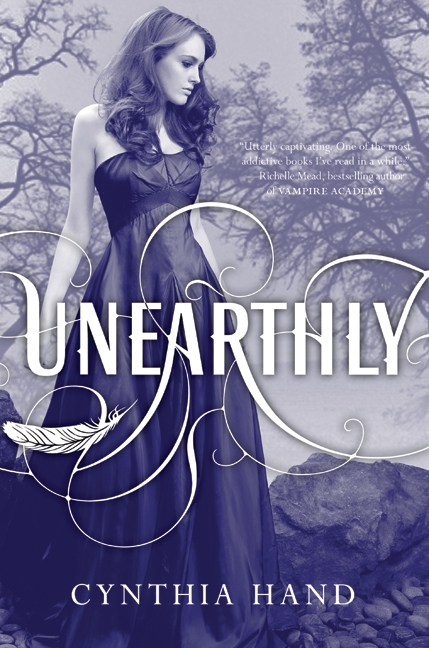 Believe it or not, as much as I do love vampire stories, I get very picky and skeptical of new stories. I mean, people get all up in arms about Twilight vampires sparkling, and yet if you read ANY vampire series, good ones that is, there are all kinds of different aspects based on what that author has written. 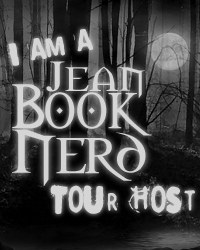 And I am a Twilight fan, but also a Buffy the Vampire Slayer fan, and a Sookie Stackhouse fan, as well as a fan of Anne Rice's vampire series. So, after reading this book, my next book I've picked up to read on my snow day is The Immortal Rules, that is how good the Dawn of Eden story in this book was. So here are my reviews of each of the stories below. As I said, the first story is Dawn of Eden, and in it we meet Kylie, who was in school to be a doctor, but we're not ever told for sure, I don't think she quite completed her education before the plague called Red Lung started taking over. It's a virus that basically does what the name says. People get sick, and begin coughing up blood as well as bleeding from other areas. Kylie is about the only doctor left at one of the few clinics left to help people. As there is no cure, pretty much they just help the people be comfortable as long as they can. One night two men come in. Ben Archer is helping his friend who is bleeding. Now the wounds look like an animal or a human even attacked him. And Archer is kind of secretive about what has happened to them, and why he is so paranoid about telling Kylie and the other workers that they need to leave, that it isn't safe there, especially at night. When his friend dies, the different symptoms he had begin spreading to the other patients, and Kylie learns what may have really caused the Red Lung virus. And now she is left with just Archer to trust and try to survive against a new creature, part vampire, part zombie it seems. I loved it! Can't wait to read the first book! The second story is by Ann Aguirre, who is the author of the Razorland series, a series I've heard was good, but again, it wasn't at the top of my TBR list. Now, it is. I don't see anywhere that this story is related in any way to that series, but I did like the characters and writing, so I know I'll be sure to move it up on my list! This story is called Thistle and Thorn. In this futuristic world some kind of chemical disaster has led to all the land being basically unlivable, unless you are one of the rich, powerful people, who build fortress cities to contain their family and friends, and keep their food and such safe. Outside of the fortresses are places like The Red Zone, where our main character, Mari Thistle lives. Mari must take care of her younger brother and sister. And to do this, like her father she is a thief. Partly because she is very small and agile. We start the story with her being about to fail her first job ever. But it almost seems as if she has been set up to fail by the boss of the zone she lives in. Once in the fortress, she is unable to find her way to her object she is supposed to be stealing, she's been given old plans of the city. Fortunately someone seems to want to help her, a guy named Thorne Goodman, who is one of the thugs that works for the boss. But seems Thorne has a grudge he wants to settle, and saving Mari can help him do what he feels needs to be done. Mari soon grows to somewhat trust Thorne, and hopes that maybe she's inspired him to make some changes if he is ever in a position that he could be in charge of the zones. 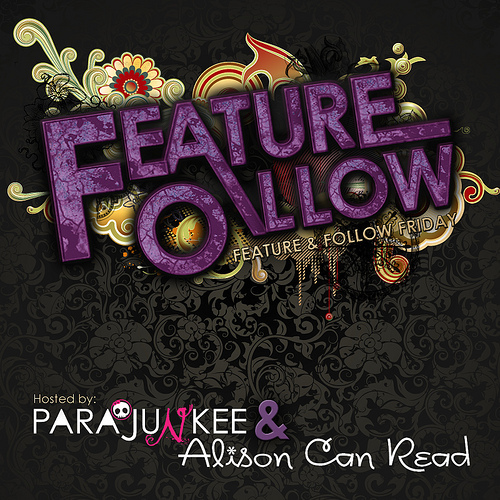 Another good story, which likable characters, and moves the books up my TBR list! Well, once I get copies of them that is. And the 3rd and final story, Sun Storm, is by Karen Duvall. I've not heard of her before, and while this story was okay, don't know that I'll necessarily search out to read her other books, from the list of them on Goodreads anyway. I definitely liked the "science" aspect of this future world. The sun has basically begun having solar flares and storms bigger than any in the history of the Earth. So bad they've basically destroyed the atmosphere of Earth. Millions of people have died from a sun fever, a few who have been exposed to the flares survive, and develop powers, like our main character Sarah. Sarah can now predict when a nearby storm is going to occur and she can go and warn those towns to try to save lives. She was unable to save her mother who died, or her father who is still in the hospital where Sarah lives and works helping the doctors when she is not out warning of storms. The interesting thing about Sarah's family is that they actually used to be storm chasers before all this happened, and so she has in a way continued that with her advance notice. One day she meets a guy named Ian Matthews at the hospital, and soon learns that he too has a power. He is able to control the weather. He can cause the wind to blow, he can take water from a source like underground, lake, etc., and cause rain. But he is a bit different and secretive. Turns out there was a federal agent that had tried to "capture" him and use his power. There was some story saying that they needed one more after him in order to stop the solar storms and even save the world. And Sarah has a strange attraction to Ian. More than just being interested in someone like her, it is an actual physical pull. She can get power and energy from him. And together, they can actually do more. But now they must run to try to get away from this bad agent, and try to discover if there really is some way that together they can save the world. This was a good story, took a bit for me to get into it, but once I did, I enjoyed it. I just don't know if any of this author's other books sound like ones I want to read. I'd love to see more like this from her. 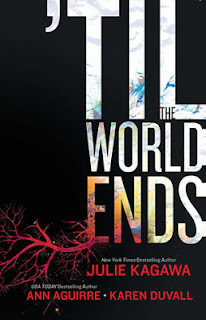 Definitely pick up this book and read it if you like futuristic, apocalyptic types of stories. I definitely recommend all three stories! 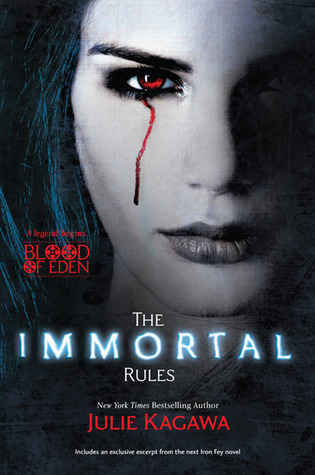 And now, I'm off to read The Immortal Rules by Julie Kagawa and enjoy my snow day! This is an exciting, yet hard to write review. 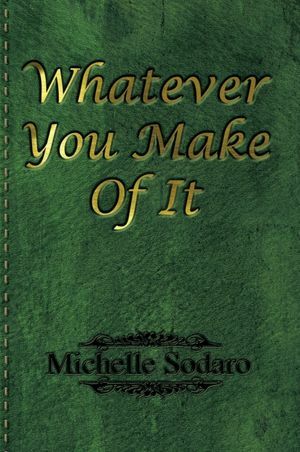 This is a book that was self published by a good friend of mine. I worked with Michelle at B. Dalton bookstore, and she also was a teacher at one of the high schools in the same district where I teach. So it's very exciting to write about a friend's book, yet also hard, because I want to say all positive things, but as an honest reviewer, I owe it to my readers to also list any problems I had with the book. So hopefully I won't hurt her feelings with anything I say. The plot of the book is a very neat idea. The main character is Johnathon. Johnathon is a lawyer on his way up the career ladder. His goal is to be the youngest partner in his law firm. Along the way he has a girlfriend named Rebecca. As you can imagine a man in this situation, he often doesn't have time for people. He doesn't really talk to his family, he feels his mom is kind of weird. Especially when she calls and tells him that his grandmother has asked her if he found the book she left for him yet. That's weird because his grandmother is dead. So when his plans with Rebecca for the evening are cancelled when her uncle goes to the hospital, he finally takes out the book and begins reading. The characters in the book, Jac and Jyn, seem to have a somewhat similar relationship to Johnathon and Rebecca. Only they are just friends. And another weird thing happens, when Johnathon reads something and remarks out loud about it, the characters in the book, some of them, can hear him. And so he begins to affect the story. The characters begin talking back and interacting in a way with Johnathon. If he tries to skip ahead to see what happens next, the pages are blank. It is as if the words only appear on the pages as he reads them. And so by reading through the story, and helping Jac to realize how he really feels about Jyn when she is hurt and falls into a coma, Johnathon also begins to figure out how he really feels about Rebecca, and realizes that he may lose her if he doesn't do something now. It was at this point that I thought the book seemed to be about finished, but still had quite a bit of pages left. Well, now we hear Rebecca's side of the story. As Johnathon tries to save their relationship, she now must decide if she should give him another chance. And to help her, he gives her the book to read. Rebecca picks up the book, and is brought into Jac and Jyn's world, but it is now a new story. It's as if the book knows what kind of story is needed for each reader. So once again, using the characters in the story, helping them with their issues, helps Rebecca to work through her issues. This part of the book was hard for me, as it starts out with Rebecca going to put her dog to sleep. Not something easy for me, or probably any animal lover, to read about! But I kind of skimmed through that part so as not to get to crying to much, and read on for the story. The characters Jac and Jyn are a bit different in this new story, and it is as if what happened in the story that Johnathon never happened. As I said, it is a really interesting idea for a story. 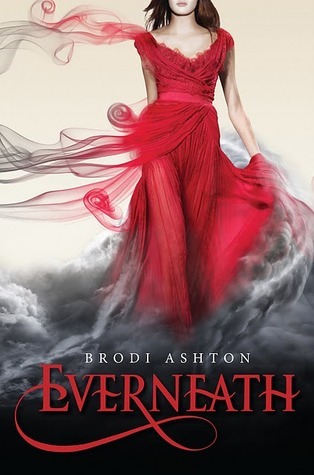 I'm sure part of the reason it took me a while to get through was because I've been reading so many YA or more paranormal even type of stories, that this isn't my "usual type" of book these days. As I've said before with other self published books, I also had trouble with how the dialogue was written. When people speak, they don't use "proper" English. They use contractions like "we'll" or "I'm" instead of "we will" or "I am". I always have trouble reading any story where the speaking parts don't just flow as if I'm actually listening to someone speak. Also, a few spots needed probably one more editor to catch some errors that I'm sure happened as exciting parts were being written and the actual writing was probably going quite fast. The names bugged me a bit too. Seeing the name Johnathon instead of just Jonathan. It tripped my mental "tongue" as I was reading aloud in my head. And Jac. Is it pronounced just like "Jack"? For some reason in my head I wanted to give it a French sound, like "Jacque". Those are my cons. At first I also didn't like the cover. I thought, wow, is that all you have to pick from for self published books? Then as you read the story, you realize the cover is like that because that is what the cover of the book they are reading in the story looks like, so I liked it. Again, I think the book was a neat story. 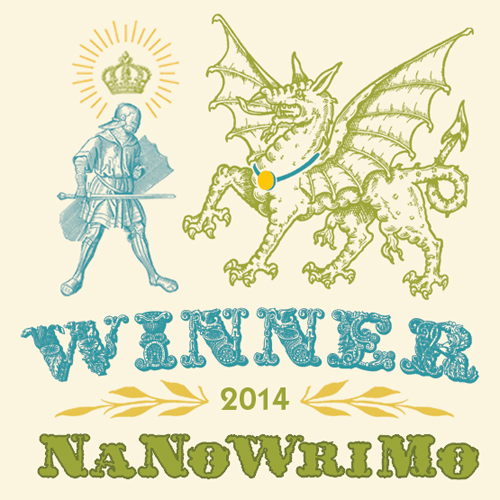 And it inspires me to get the novel I started several years ago finished soon, and maybe try to self publish it one day. This is Jay Asher's 2nd book, and I'm still a huge fan! 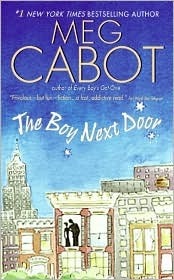 This is the first book of Carolyn Mackler's that I've read. While the topic is way less serious than Asher's first book Thirteen Reasons Why, it was one that intrigued me as soon as I heard about it. Two teens in 1996, Emma and Josh get online with Emma's first computer, using a phone line, and the old America Online CD-ROM that Josh has brought her. The funny thing is, when they log on, they find a website called Facebook, and it seems to be their own Facebook pages, from 15 years in the future!! So that's 2011. And Facebook wasn't even really invented till 2003, so obviously there is no way these 16 year olds could have logged onto Facebook. Turns out that little things they do or decide to do changes what shows up on their Facebook page. Emma notices that her husband is first gone fishing, then missing and presumed to be cheating on her, and soon she's very unhappy with him it seems. So she finds this person in real life and makes sure that she will never hook up with him. This does send a big ripple through time, if we are to believe that this Facebook page is really from the future. Now Emma has a new husband, and may or may not be pursuing her dream job of marine biology. Josh on the other hand seems to be married to one of the most popular girls in the school, up until now, he's not really hung out with her. The sad thing is that Josh and Emma have been best friends for years and years. Until one night Josh thought that Emma might have more feelings for him, the same kind he had for her. But when he went in to kiss her, she pulled back, and made it clear she didn't want that with him. Since then Emma has had several boyfriends, none that seem to last long. While Josh's future life, as seen on his Facebook page, doesn't ever seem to be a bad one, just changes in the number and sexes of his children, Emma's never seems to live up to what she wants. And this causes her to keep trying to change things, even going so far to try something with Josh, something that pushes him away, to the point that they are no longer friends on Facebook. Emma has to examine if what she's doing will ever make her future any better, or if there is actually something she needs to work on now about herself, rather than trying to get it fixed with other people. Josh needs to determine if the popular girl is really his dream girl, or if that girl is who he'd always thought it would be. Again I love the humor! The way they first view Facebook, as a page where people post really boring things, like what they had for dinner. It amuses me because it is so true, I do it myself. And yet it pokes fun in a non-insulting, fun way. I love the humor, I love the story. Even though you can kind of figure out where it is going, it still is fun to read and see how it gets there. And because I always love to talk about getting to meet my favorite authors, here is a picture of me with Jay Asher at the Missouri Association of School Librarians a few years back when he presented a session, and was there to pick up his Gateway Award for the year before. I got this book a while back at my school's Scholastic Book Fair, and pulled it out back in January to read. I've been keeping it in the master bathroom for during bubble baths, because either the book I was reading was too big or I was reading on my Nook, and I don't want to have that near a tub full of water! The story is about a group of teens who get snowed in at school. School gets let out a bit early because of the coming blizzard, but a few of the boys decide to stay to work on their project in Shop Class. One guy is there because of detention. And there are also a couple other students left there, waiting to be picked up. For a short time there is a teacher there with them, but that first night he goes out looking for help, and he never comes back. Scotty is a sophomore, a basketball player. He and his friend Pete and Jason stay because they figure Jason's dad will be able to still come pick them up even with the snow. Les is kind of the guy who is trouble, he was in detention. And is really pretty scary. Krista and Julie are the girls that are there. Scotty thinks Krista is really hot, and Pete is interested in Julie. 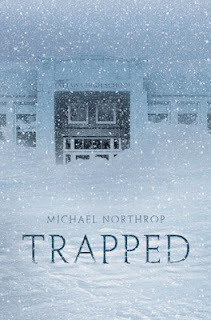 As they stay there, the snow doesn't stop, and soon they realize the teacher isn't coming back, and no one is coming to get them at least tonight. So they spend the night there. But then the power goes out, which means even with a back up generator, soon that goes out. And the snow keeps coming down. They're fortunate that of course the cafeteria has food for them. Eventually of course the pipes freeze, not to mention with no lights and no heat, the bathrooms get to be freezing inside. The longer they are there, the colder it gets, and soon they decide to build a fire in one of the classrooms, and they have to figure out how to have a bathroom. They have no other clothes. Although, I wonder why they don't try to get the keys to the lockers from the office or somewhere so that they can look for clothes in other people's lockers. They do go to the nurse's office and find blankets. Soon the snow gets so high that the windows on the first floor are covered. And so they move to the 2nd floor of the school. Soon they hear the roof start making noises, and things just don't seem to be getting any better. Their cell phones don't work, but that's not that unusual, they don't really get that great of reception there usually. They find a radio in the office that they use to listen to find out what is going on. And it doesn't sound that great out there. Then one day, when they've begun to feel really desperate, they see a helicopter in the distance. At this point they begin trying to think of how to get out and get someone to know they are there. The story ends pretty quickly. And we don't get to find out what happens to everyone. But it is a good story. Not thinking people in the way of Nemo want to read this right now, but may be feeling some of the same things! Once again I'm participating in a Hop sponsored by Kathy at I Am a Reader, Not a Writer, and also Rachel at Keeping it Clean. 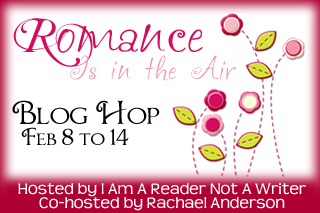 This Hop will feature Young Adult and Clean Adult Romance. I have several titles, they are ones that I found the romance to be very good in. But you don't have to pick one of them, you can pick any book that has YA or clean adult romance as long as it is under $12 at the Book Depository. And since I am shipping from there, this contest will be international for anyone that TBD ships to. And after you've filled out the Rafflecopter below, make sure to hop along to all the other great blogs taking part in this giveaway in the Linky at the bottom. My first "adult" book of the year! I told myself that this year I need to try to read at least one adult book a year, as I mostly read Teen/YA. And this book was good, but I know now why I read so many more YA these days. I realized just how wordy Dean Koontz can be. Some sections just went on and on, and I was ready to get to the point. In fact, I'm sure I skipped a bunch of paragraphs, and sometimes had to go back, because I was skimming trying to get on to some actual action. It makes me think about how I'm teaching my students about figurative language in my Communication Arts class right now. Figurative language is great! Helps you feel like you're right there in the story sometimes! But too much can be a bad thing. Whole paragraphs or pages even. Okay, I did enjoy the book, it was a pretty good story, so let me talk about that now. I figured there would be more to do with short story The Moonlit Mind that I read last year, and that made me very excited to read this book. There wasn't, and maybe I need to re-read the short story, but I don't quite see the connections. I'll have to read it again. Anyway, as many Dean Koontz books do, we followed several different characters. All of which live in a huge mansion turned into condos, called The Pendleton. Every 38 years strange and terrible things happen. Murders, people disappear. And this is the 38th year coming up. Strange things start happening. People see ghosts from the past, the years that people disappeared. There are strange shapes swimming in the pool. When they look outside, during the thunderstorm, sometimes the lightning lights up showing there is no city out where there should be. All of the people we meet begin experiencing things. Some have worse things happen. And some are able to figure it out better. We of course have one evil character, a murderer, who all of them are locked in with. We have two children with single moms. We have a former military man, two elderly women, a woman who lost both her parents to lightning strikes. A woman who was a country singer, a man who grew up in Viet Nam during the war, and a scientist? There is also one guy researching the history of the Pendleton. Eventually the curse or time warp or whatever goes all the way through. In this other dimension, or the future as we learn, there is The One, who is like a god in a way, controls everything. There are no humans, other than one named Witness, although he is not technically human. One of the characters recognizes him, and we find out exactly what has happened. One other issue I had is that while I feel there was a ton of build up and all, that we get to the end we're barely let in on what the actual deal is, and then we're back in the present and it's kind of over. I liked the way it ended, again, don't get me wrong, just was a bit anti-climactic. Not a bad Dean Koontz book, just hard to read that kind of book again with what I've been reading lately. 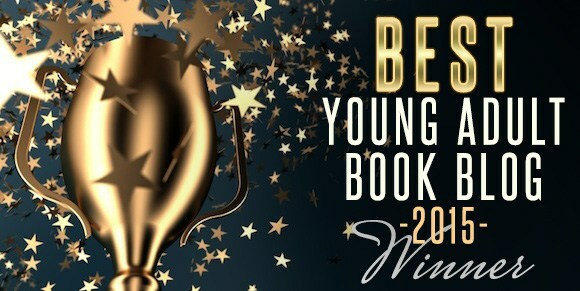 And hey, some of those YA books are big too, think of Divergent!! Thanks to Scholastic and Netgalley for allowing me to read an e-galley of this book in Fall of 2012. I have always been fascinated by the Holocaust. It just amazes me that things like this can actually take place in real life. That people can be so horrible, and other people just look on, or look away and let it happen. The reviews already posted on Goodreads were a bit down on this, one said that some of the stories were copies of other stories? I don't know about that. I mean really, the stories of the Holocaust will all have similarities, this happened to a lot of people! In this story we follow Yanek, who begins by living with his family, in what will soon become one of the Jewish ghettos. His family's apartment will soon become home to several families, as the Jews are forced to all move in together. We see him get to do a little rebelling when he sneaks out with his father to a family bakery. Then his family is able to stay together longer when he discovers a room on the top of their building that they are able to hide in whenever the sweeps are done that pull people out to go to the camps. They make it quite awhile, until one day he comes back to see his family being taken away. Soon he lives on his own, until he is taken away to a camp. When he gets to the camp, he sees his uncle and cries out to him. But his uncle motions him away and walks on. When the guards hear this, but don't see who made the noise, they end up killing another person. And now Yanek has learned the way of the camps. Don't be noticed, do your work, but don't work too hard. His uncle does what he can to help him. By helping him get jobs in places outside, away from a sadistic soldier, it saved him. But one day his uncle is killed, and he has no help. Yanek gets moved from camp to camp. We get to see his experience through the cattle cars, standing stuck next to people who had died. Then camps that were famous. And finally even a death march. That he survived. He was in camps where they made them work by digging holes, then filling them back in. Carrying rocks to one side of the camp, only to have to carry the large heavy rocks right back. Through it all Yanek was lucky enough to last, and barely scrape by. This is supposed to be a true story, and it is something I will want to look into and read more about. Once again I feel this is a good picture of the time, a snapshot of several different camps and the way people survived, or didn't. It is one that I would add to my collection of books on this subject, and will recommend to the Social Studies teachers I work with.